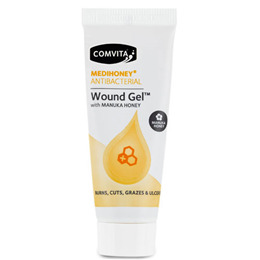 Comvita Medihoney Antibacterial Wound Gel with manuka honey can be used for burns, cuts, grazes and ulcers. It encourages wound healing and reduces scarring, it also naturally cleans the wound of dirt and bacteria, reducing the risk of infection. The Wound Gel contains 80% Medical Grade manuka honey and is certified natural by the Natural Products Association. During the heat of the early summer it produces a profusion of flowers a-buzz with bees busily collecting nectar to make our unique Manuka Honey. Special techniques have been used to ensure that Comvita Manuka Honey reaches you in optimum condition, just as nature intended. Apply a generous amount of Medihoney Antibacterial Wound Gel directly onto the affected area or appropriate dressing. Cover the wound with dressing and change every 1-3 days. Below are reviews of Comvita Medihoney - Antibacterial Wound Gel - 25g by bodykind customers. If you have tried this product we'd love to hear what you think so please leave a review.